Last week I visited the Mercedes GP wind tunnel testing site in Brackley, Northampton. The wind tunnel is hired by drag2zero who offer a service to test people in time trial position for wind drag. It involves putting the bike on a turbo and riding at a speed of around 30mph (turbo is set to very low resistance). Then there is wind sent through the testing position. 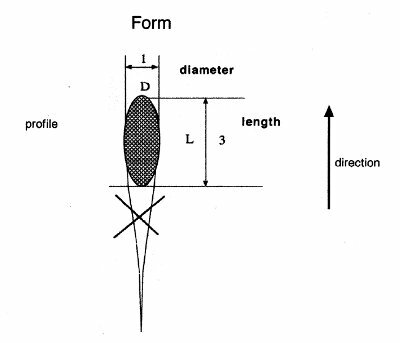 The machines and computers are able to measure the amount of drag different positions give. This enables you to see the aerodrag different positions give. I only ride in one UCI event a year – the British time trial championship. But, I still wanted a position which is UCI legal. We tested different angles of aerobars. In my case raising them up proved to be more aerodynamic (praying mantis). This position also made it easier to keep head low but eyes looking ahead. I couldn’t use this position for the UCI event, but it’s not a big deal just to drop aerobars for the one race. Note. It doesn’t automatically mean you will be more aerodynamic if you raise your aerobars to this position. I know of one rider who found he was more aerodynamic with aerobars horizontal. But, it’s one thing worth testing as it can make quite a difference. One thing that makes a big difference is head position. My head position was quite high, effectively adding more aerodynamic drag. The main benefit was gained through finding a lower head position that was still comfortable and kept eyes on the road ahead. Also changing helmets helped reduce drag. Something like changing helmet can make a big difference. There is a 2 – 2.5 hour slot. In this time I had chance to do 7 or 8 test runs in different positions. They seemed quite experienced in suggesting best things to change and how to get aero drag gains. By the end of the testing, I had about 10% lower aerodrag which is quite a lot of watts. The first races in the new position was quite encouraging. On the H50/1 I took 3 minutes off my pb for a 50 (again was quite windy). I reduced it to 1.49. These races were without all the changes. For example, I’ve bought a new helmet Giro Advantage because it was the most aerodynamic for my position. I’ve also just cut the aerobars down today and fitted a smaller stem. These improvements in time are not just due to aerodynamics. I’m in good shape this year, and have set some pbs on hill climbs I use in training (though these pbs were minor improvements) However, to take 1 minute off a 10 time is not just due to finding an extra 75 watts or whatever in power! After the event, I was given photos of each position, and you can see the improvements in aerodynamics. I won’t post them here as there are restrictions about posting photos of wind tunnel without permission. However, when I get a new photo from a race, I will post position and compare it to previous positions. Firstly, it’s not cheap. It costs £899 for a 2.5 hour session. It’s also a considerable investment of time. However, in my case it was definitely worth it. These aero savings are really quite big and can make difference between finishing 1st or 5th in races. It’s the kind of thing which will motivate me to enter national championships next year, as I now feel a realistic chance of getting in top 20. To put in perspective, two years ago I bought a new time trial frame (Trek equinox) it cost £1,199 and made no noticeable improvements in time over my old steel frame. So compared to buying a new frame, wind tunnel testing has made a much bigger improvement in time. To some extent you can make educated guess work in finding a better position. Also just knowing how much difference aerodynamics makes should encourage a time triallist to give it great importance. Also if you have a power meter and track, to some extent you can measure aerodrag from different positions. But, when I saw how complicated it was to do, I booked a session. The first test is always going to yield the biggest results. If I went a second time, it would be really for testing marginal improvements. I’m sure there are a few marginal gains to be found, but it would be harder to justify the cost.. I can see why professionals spend a lot of time in wind tunnels. I guess everyone will be different, there’s no guarantee to how much or how little you will save. But, if you can save a lot of aerodrag, you will make a big difference to your times. Testing made me consult the notorious UCI rules on positions. They change more frequently than the numbers on a roulette wheel. But, these seem most important. just to make it confusing some levers are included in this distance, some aren’t. 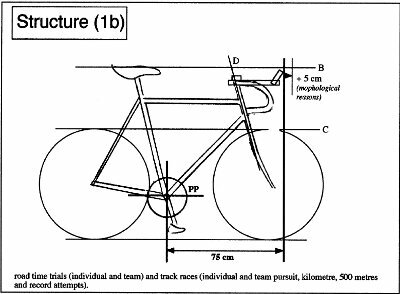 Aero bars have to be horizontal – the praying mantis position is no longer allowed. Any piece of equipment should be no more than 3 times in length than width. This is to prevent extreme aero fittings.